Sailing and snorkeling adventure aboard a luxurious 42 feet sailing yacht. Snorkeling area: Cabo San Lucas Bay - the Pelicans Rock. 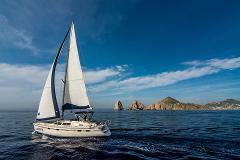 Sailing in Cabo San Lucas area, the sea of Cortez and the Pacific ocean. Included: open bar, light lunch, snorkeling gear and towels. Relaxed sunset sailing aboard a luxurious 42 feet sailing yacht. 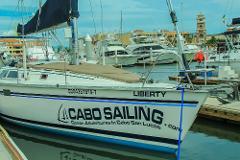 Sightseeing, and sailing in Cabo San Lucas area, the sea of Cortez and the Pacific ocean.